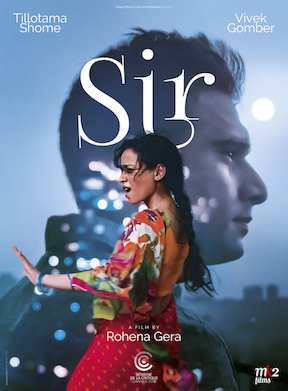 Set in modern-day Mumbai, “Sir” is a thoughtful study of class and the way it can both restrain and empower. Writer-director Rohena Gera has crafted an intelligent romance within the confines of upper-crust Indian society. Ratna (Tillotama Shome) is a young widow transplanted from her small village to the megalopolis of Mumbai, where she’s employed by a wealthy family of builders to serve as a chambermaid for their son, Ashwin (Vivek Gomber). As the story begins, Ashwin’s impending wedding has been called off after his fiancée was found to have had an affair. Left alone to work for his dad’s company and brood a lot around the house, Ashwin will slowly develop a bond with Ratna that extends beyond a mere master-servant relationship into something more. Still, Indian society remains strictly hierarchical for the most part, and “Sir” ultimately reveals how unbridled emotions cannot survive in such an environment. Westernized in thought and attitude, Ashwin treats Ratna like a friend rather than a maid, but faces the pressure of his family and social standing. And Ratna, who as a young widow has very few opportunities in life, is smart enough to know that her story with Ashwin will never end happily ever after. With “Sir’ as her first fictional effort, director Gera has crafted a warmly nuanced look at love in a place filled with constraints and contradictions, and where a broken heart could perhaps be the first step toward emancipation. © 2019 North of Superior Film Association.